two-tier production area, isolated audio booth, and seperate replay area. 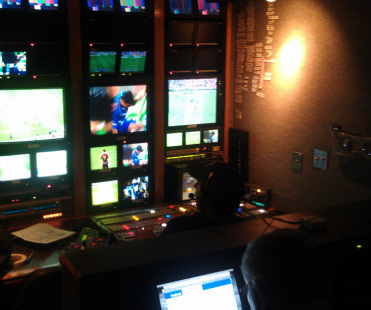 Equipped with a Grass Valley Zodiak Switcher, Yamaha Digital Audio Mixer, a 6 chanel EVS, and 6 Sony Triax cameras, Ernie has been used in an extremely wide variety of scenarios, from college sports to entertainment shows and corporate events. Ernie also makes a great companion to larger trucks as a secondary unit or international feed and is highly configurable to handle different types of jobs.